Birds of Paradise are too snazzy to bother building or offering anything but their own beauty, which, to be fair, is remarkable. So rather than build structures, they've developed incredible dances to show off their color and style, and they've come up with some doozies. Have a look! The fancy dress and snazzy dance are all about female choice. They don't help the male birds of paradise or peacocks survive - the colors, extra feathers, loud calls, and wild dances actually slow them down and attract predator attention. That's the secret -- by looking ravishing, building fancy structures, or dancing athletically, the males show how strong and virile. If they can take time away from eating and escaping predation to dress up and make a racket, their proposal suggest, they must have excellent genes and therefore are worthy of selection by the ladies. 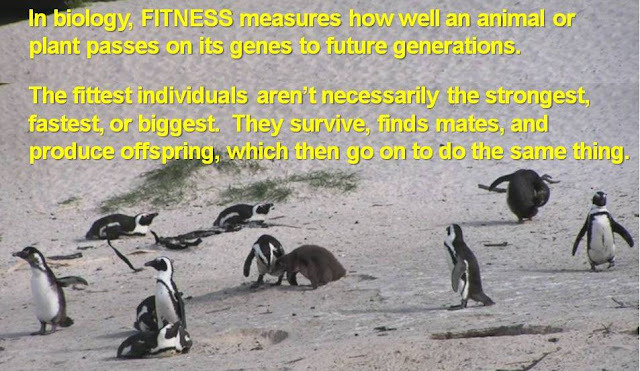 If that trait really indicates a stronger individual, then the offspring of the females that mate with him will be more likely to be strong and reproduce, passing that same gene on to their offspring. Etc. If this trait (e.g. a long tail, red bill, a mane, big antlers) continues helping guys survive and mate, it becomes ever more common in the population until it becomes the norm. That's sexual selection. Charles Darwin came up with the theory of sexual selection - basically that not all adaptations helped an animal survive; some helped them mate, which is, of course, the whole point of survival in the first place. And, if you're still watching -- this one shows some of us are right in there with these other species (at least we were in the late 1970s!). Think of a) the peacock and b) the dancin' birds of paradise!